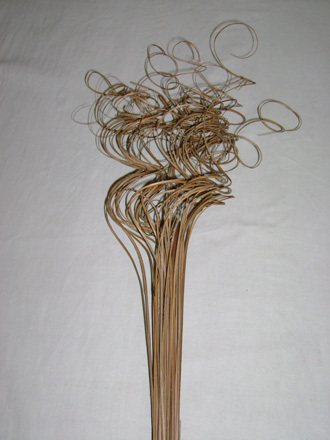 Natural colored curly ting ting is an excellent way to further enhance the appearance of your reed diffusers. Arranging a few pieces of ting ting in with your reeds adds a real high-end look to your arrangement. These also look great in your flower arrangements or other craft projects as well. For decorative purposes only as ting ting absorbs oil but does not diffuse oils. You will receive approximately 25 pieces in a bunch. The stem part is approximately 7" long. The curly part is approximately 6".